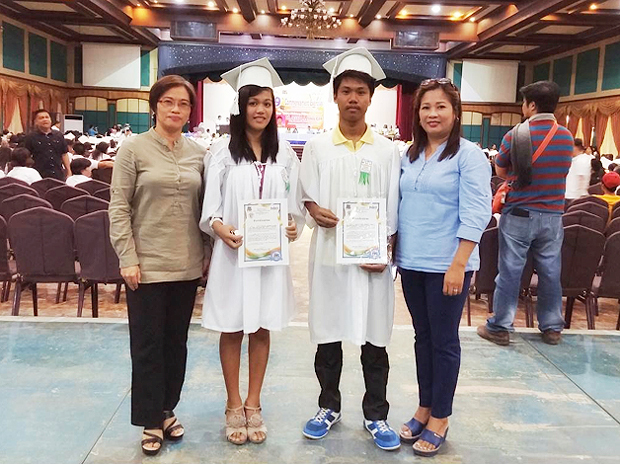 The Philippine Department of Education’s Alternative Learning System (ALS) celebrated the commencement of its ninth and fifteenth classes of participants on July 3 and 15, 2015. The Global Peace Foundation supports the Alternative Learning System through GlobALS, a program that imparts knowledge, skills and values to out-of-school youth and adults to make them functionally literate citizens. Twenty-four individuals from DavNor and Nueva Ecija completed the ALS program and now see new possibilities that lie ahead because of the skills and education provided to them. 15th ALS Graduation Ceremony in Davao del Norte in July 3rd. Since its inception in 2004, Alternative Learning System has sought to “improve the quality of life in rural communities by raising literacy levels of ‘target areas’ in the Philippines.” From single mothers, individuals who put their own education on hold to raise their siblings, communities ravaged by poverty, to those who were victimized by sexual or physical violence, ALS is working to raise literacy levels. Where there are large populations of out-of-school youth and other at risk populations, Alternative Learning System is providing opportunities and hope. Many of the participants of Alternative Learning System are hard-working and determined individuals who faced challenges or made sacrifices in their lives which led to their discontinuation of school. Rather than being discouraged by the obstacles of life, ALS graduates have found strength in the adversities they faced. It is this character of resilience in participants with which ALS looks to harness and provide them with developmental opportunities. Global Peace Foundation Philippines staff. In addition to improving literacy skills, Alternative Learning System also works with participants who have practical work skills and hones the individuals’ communication and interpersonal skills to make them more appealing to potential employers. Reymond Patria of Ising Carmen, Davao del Norte worked in masonry and welding jobs but often found it difficult to advance in these fields without higher education. Now that he has completed the ALS program, he said, “an opportunity has been opened for better employment.” He plans on continuing his work training and hopes to one day own his own business. Like Nina, Rica Espinosa is determined to use the education provided by ALS to continue on through college and strengthen communities throughout the Philippines. “I am determined to finish college because I want to show my siblings and other young people that poverty and hardships in life are not hindrances to success” Rica said. Through education and a strong support system which believes in the intrinsic value and abilities of each individual, ALS is working to dismantle the systems of continued poverty and illiteracy, one person at a time. The program is transforming communities who are often bogged down by the reality of their current situations and inspiring them to look forward to the future. “What Employers Want (How To Get A Job)” Presentation during an Interaction Styles Inventory activity. In the words of Hirose Banayang, a single mother who was a part of the ninth graduating class, “Education is one step for me to show that I can rise up and start all over again, strive harder and persevere for my new future.” Rather than being discouraged by their life stories, the graduates emerged stronger and more determined to be successful in their future endeavors.